One of the best things about Cinco de Mayo is how bright and colorful this holiday can be, especially here in the Southwest. 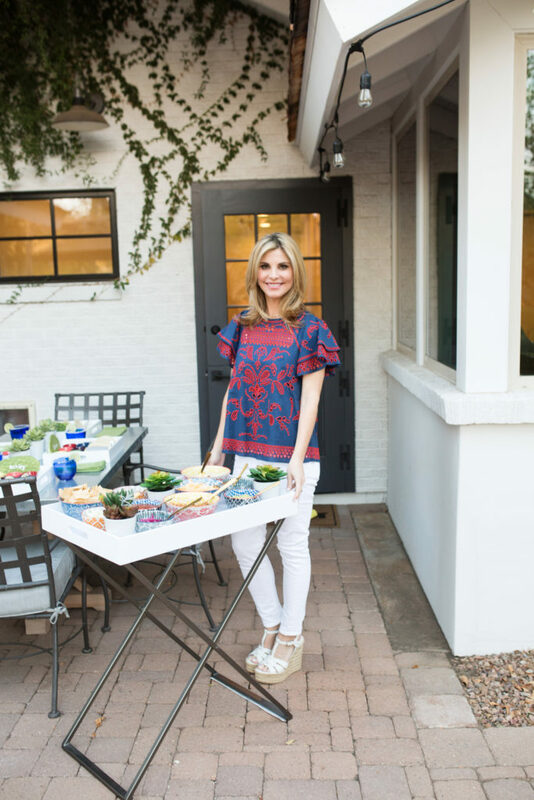 Tacos, margaritas, and chips are pretty much a mainstay for any fiesta, but for this occasion, I wanted to throw in a little twist. 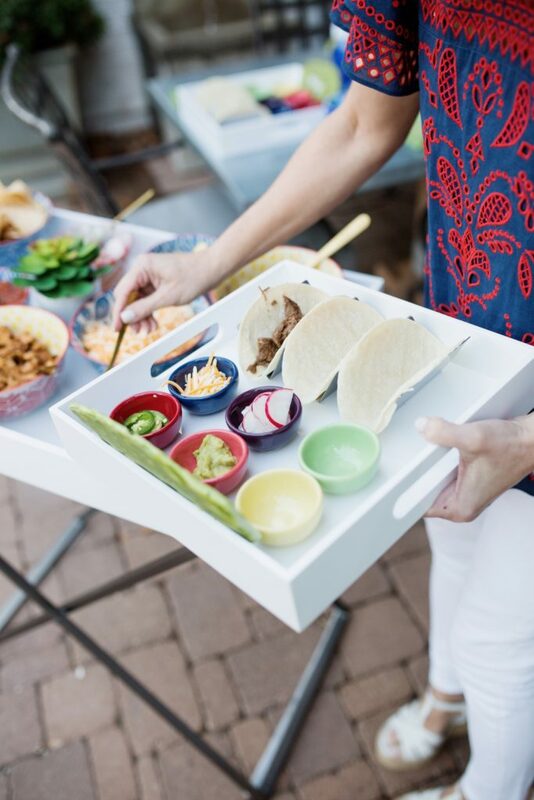 With the help from my friends at West Elm, we created a super unique party with individual taco bar trays for our guests! For this collaboration, we decided to revolutionize the taco bar — taking it a step further by giving every guest their own individual taco bar. With a spread like this, each guest can construct their very own culinary feast without having to leave their seat. Read on to see how we did it! Repurposing is a huge priority for me and I love to purchase items that I can use over and over in different ways. That’s where these square wood-lacquered trays came in. They served as not only a carrier for my guests’ food, but also became a place mat once guests were seated at the table. Pro Tip: Use these multi-taskers to serve drinks, organize odds and ends on a dresser, or hold a stack of books on a coffee table. 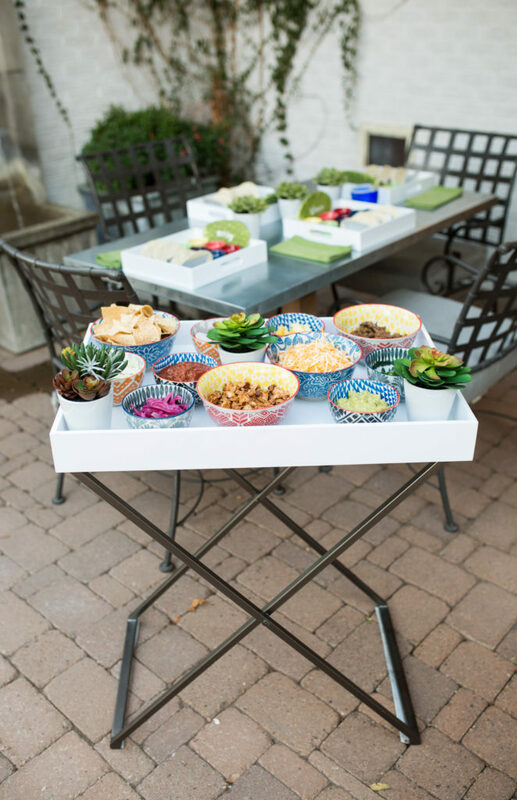 We used West Elm’s large butler tray for the buffet of taco fixings — this allowed our guests to take their trays to the taco bar station and select their toppings. Each guests was then free to go sit and enjoy their meal, sampling and experimenting with different toppings without ever having to get up again. Pro Tip: Repurpose this tray as a side table or serving caddy in your house once the party is over! A Cinco de Mayo party just wouldn’t be complete without a beautiful explosion of color. These tiny multi-hued ceramic bowls deliver big time. They come in a set of eight, so I’ll use them for nuts, candy, or olives after this party! I mixed and matched the funky printed cereal bowls and vibrant serving bowls for an eclectic look. Don’t worry if the patterns and colors are different — that’s the beauty of these bowls! They all work together seamlessly. 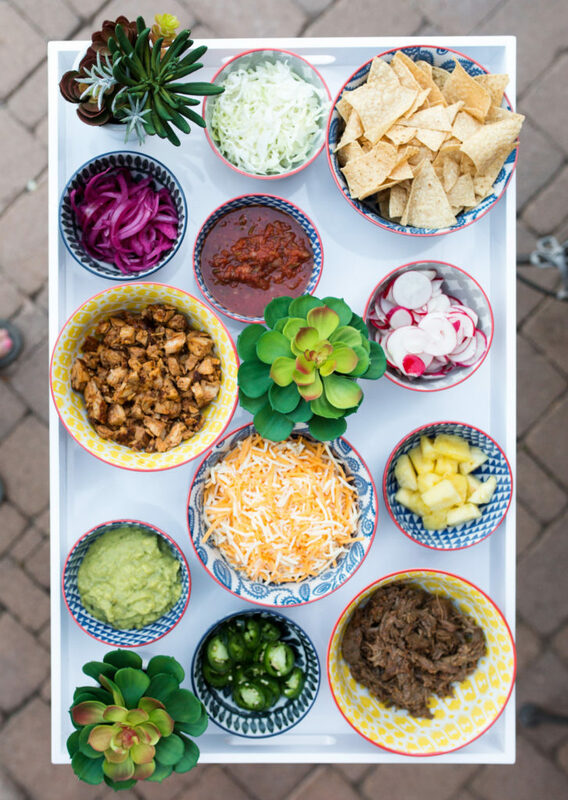 Who could resist a taco bar spread like this?! Because there is so much color incorporated into this theme, I chose a few faux potted succulents to adorn the table. These stay fresh all year round and you never have to water them! For an unexpected touch, I purchased some fresh nopales (paddles from prickly pear cactus) and used a chalk pen to write everyone’s name. Pro Tip: You can find nopales in most grocer’s produce sections. If yours doesn’t offer them, check your local specialty foods purveyor. They come de-spined, and are easy to work with. 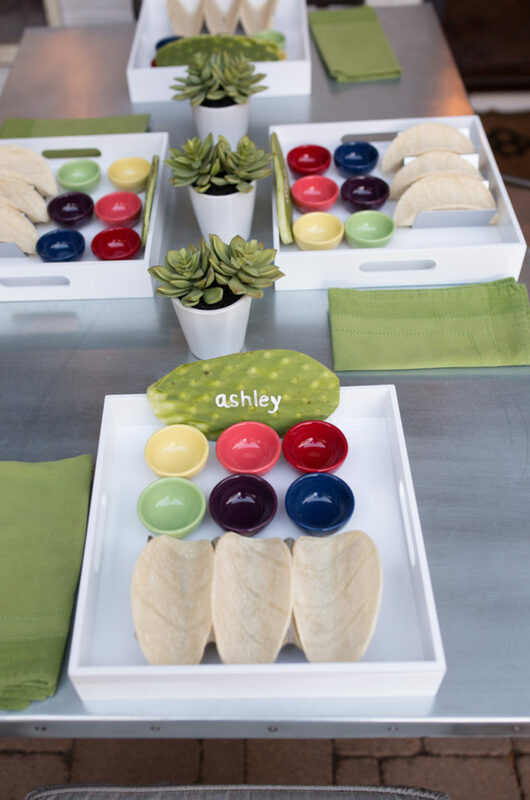 Aloe green linen napkins kept the focus on the beautiful display of food! 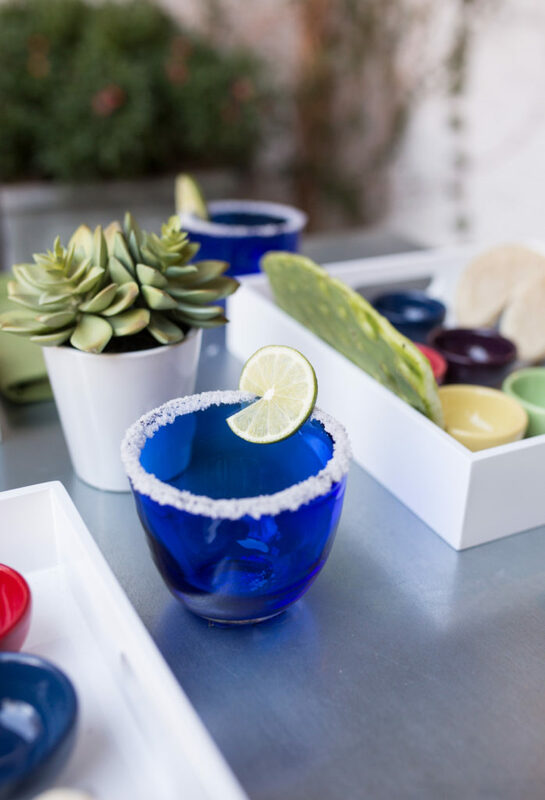 Vibrant cobalt blue glass hurricanes served as my margarita glasses — just line the rim in water, dip in salt, and add a lime slice! Here’s a classic margarita recipe. These blue hurricanes give the table setting a nice punch of extra color. Check out another way I used them here. Here’s where I made it super easy. Most of the food came from the salad bar at my local gourmet grocery store. Admittedly, it was a bit more expensive, but the time it saved was instrumental. I grabbed the pre-cooked, shredded seasoned chicken and beef from Costco to save even more time. For dessert, I’d suggest traditional flan, but if that’s not your thing, cinnamon-dusted churros are always a hit! Love this idea. Where did you get the things that hold the tortillas? Hi! So funny – I think I got those on Amazon. They’re stainless steel and were very reasonable! Just about the only thing that ISN’T West Elm!! Lory, as always this is so colorful and festive! I love the nopales idea – so clever. I am a big fan of West Elm bowls~ I do use them all the time! Now you have me wanting to do something special for Cinco de Mayo!